You are seriously never in a bad mood. Never. Besides being freakishly inspiring, your personality is also fodder for the perfect Halloween costume! Your good nature is precisely why this look will be so hysterical to your friends and coworkers. Don this classic curmudgeonly look and thrash about a big bash in the trash. In this licensed Adult Oscar the Grouch Costume, you will get to play at being grumpy all night long! The look is so realistic, even you may not recognize yourself in the mirror, all dressed up as the furry, irritable but also somehow lovable character of Oscar from everyone’s favorite, Sesame Street! You can band together with a bunch of pals for a great group costume, or “grouch out” solo and sulk in a corner, alone. 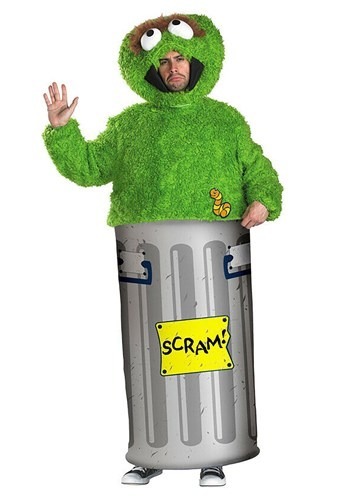 Of course, your pals may not stick around long when they read the “SCRAM!” sign on the outside of this costume’s trash bin. And then who will you have to complain to? Oh well. It’s tough being a grouch, huh? We guess it’s good that you’re not on in life, then! So just enjoy a night dressed as your alter ego in this fuzzy green jumpsuit and headpiece. You may want to practice your rendition of “I Love Trash,” as nostalgic pals everywhere will ask you for a performance (and let’s be honest, even dressed as a grouch you still can’t help but want to make your friends happy). Quality was mediocre at best. Shipped just in time for Halloween but i really wasn't a fan of the quality.